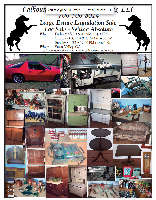 Professional customized advertising includes ads in local paper publications, several web sites, customized flyers distributed in local area on larger estates, as well as advertising through web and email blasts, and Facebook, and I use large yellow--easy to see signs at multiple turning points. 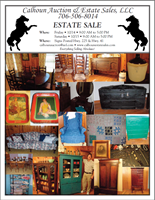 Dispersal of all Inventory ---- YES ---ALL THE CONTENT WILL , OR CAN BE SOLD....! 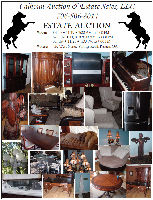 A well managed, well displayed Auction or Estate Sale is always more profitable. 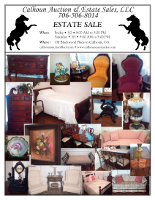 Calhoun Auction & Estate Sales LLC. , Does Not offer delivery of items purchased at any sales at this time. When you call and get a voice mail, please leave a message and a call back number so they can return your call. HIGH EXPECTATIONS CREATES GREAT RESULTS! 1401 Block, 1503 Red Bud Rd. 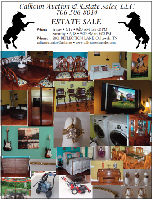 Copyright (c) 2008 Calhoun Auction & Estate Sales LLC. All rights reserved. 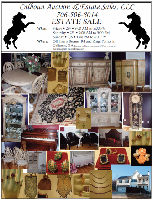 Design by CSS Templates -- Hosted by EstateSales.NET.